I will admit, it is nice to start talking about custom ROMs for Motorola devices again. After a breakthrough on the unlocking of Moto bootloaders, developers have been hard at work to bring their ROMs to a new line of devices. 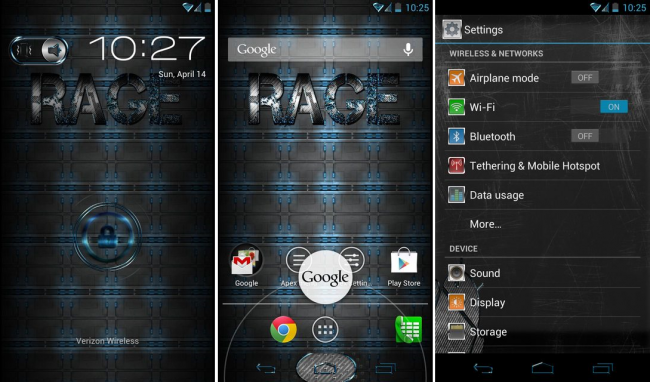 Today, we are featuring RageHD for the DROID RAZR HD on Verizon, developed by BigDaddyHicks and his team. This ROM looks to bring a smoother experience to users, with a de-bloated (thank goodness) and zipaligned system, you will be flying though apps. PIE controls have been added for an extra-classy way to control your device, Goo Manager has been installed for easy updates, plus battery tweaks were performed to increase your device’s daily lifespan. To top it off, there is already a theme available for the ROM called Metallic Blue which is shown above. Pretty snazzy looking. To download and install, you will need your bootloader unlocked and a custom recovery installed. If you need to do that still, look here on this post. If you are already unlocked and ready to rock, follow the via link below.